Church websites help faith communities around the world to maintain a great online presence with daily sermons, event management, accepting donations, allowing sign up and much more. Non-profit organizations, church and charity websites, faith communities can benefit hugely from this collection of church WordPress themes. 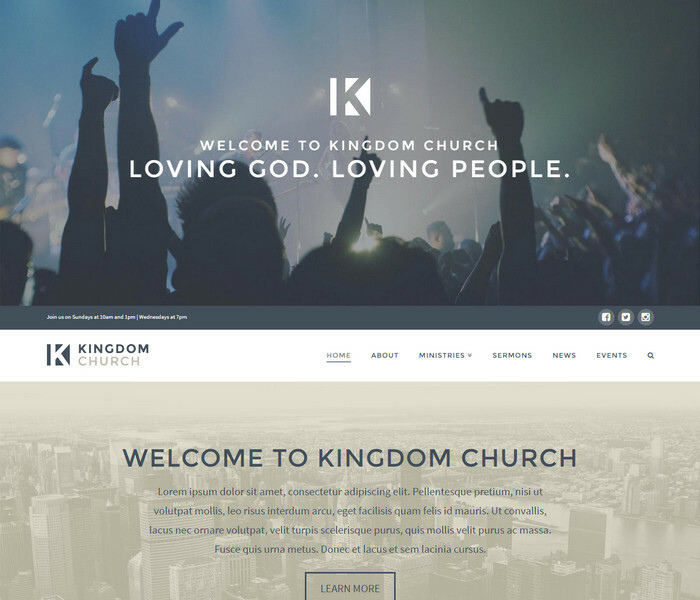 You must also check live examples of church website designs we wrote in our last topic. Websites build with the help of WordPress CMS gives you many customization options to build your homepage. Most themes offer Visual composer to build custom page layouts with the help of drag and drop interface. A professional workflow and clean design is a must for any website, thus WordPress Themes are the best bet. If you are a non-profit organization, religious organization or run a charity website, church website, here are the best WordPress Themes that will suit you. By the way, all themes listed here are well researched and have basic features like custom logo upload, site title change, responsive design, widgets, admin panel etc and the essential features are listed with each theme. Church Suite is a retina-ready premium theme that offers great support for making your own church website in little time. It lets you manage events with event calendar and display latest sermons. This feature makes it perfect for community groups, prayer groups, churches and charities who want to keep track of upcoming events. You can add latest church news and display them in the blog section with ease. The SEO friendly website design makes sure the website loads quickly and at the same time being mobile responsive. The best thing about this theme are the essential features like event modules for meetings, built-in sermon manager and the church causes, donations section. The Visual Composer integration makes it easy to customize the website using a live drag and drop interface. The theme is compatible with WooCommerce plugin giving you the opportunity to sell your products as well. Build a modern church website, charity website or even start a fundraising campaign. 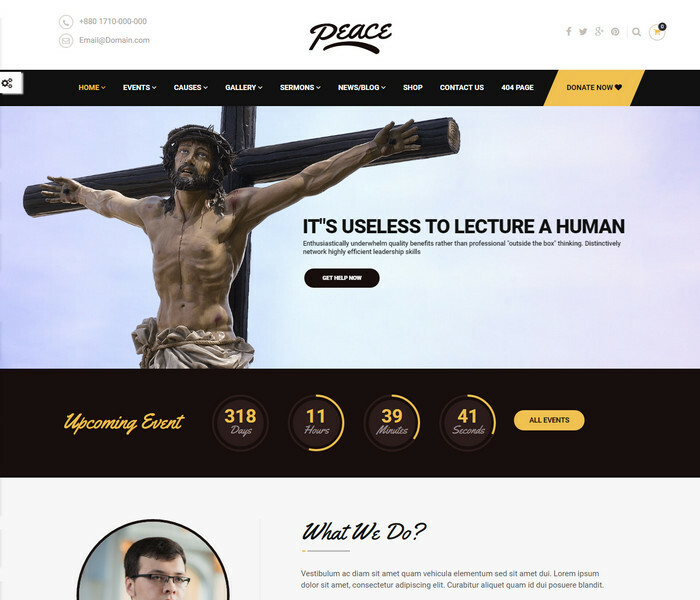 Just like the name suggests, this theme is best for church websites and it is built on top of latest HTML5 & CSS3 standards. The theme page builder lets users create custom page layouts just by a simple drag and drop. The theme is responsive on mobile devices, smartphones, tablets, large desktops and also cross-browser compatible. You can easily transform your website into a store to sell your products using the Woocommerce plugin. They also offer a superb customer support for whenever you are in doubt and need help. The theme lets you add, manage upcoming events and display them on any page with event management feature. Event calendar also lets you export yearly, monthly, weekly, daily events. The options panel will help you add a countdown timer which will count the next event time and show it on your homepage. Build a church website, a non-profit website with sermon archives, church news events and also have an online store for business. 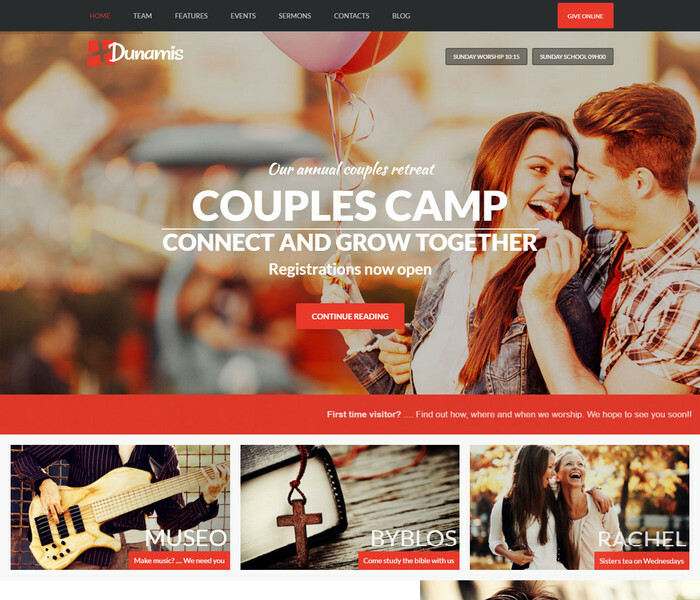 Dunamis is another great church, non-profit WordPress theme that is crafted to give a modern design look to Church websites, religious websites, non-profit organizations and more. You can organize donation camps, host events, add audio sermons and also display latest blog news with a brilliant image slider. A mega menu is built into this theme which can be managed from the options panel accommodating more links. The theme also offers great features like parallax front page builder, donation manager and multiple event calendars with table type events and agenda type events. This theme is also translation-ready, features responsive design layout, has a countdown timer, lets you choose od podcasting, woocommerce integration support etc. Build a charitable faith community website that let users join a team or small prayer group also let potential doners donate to a cause. 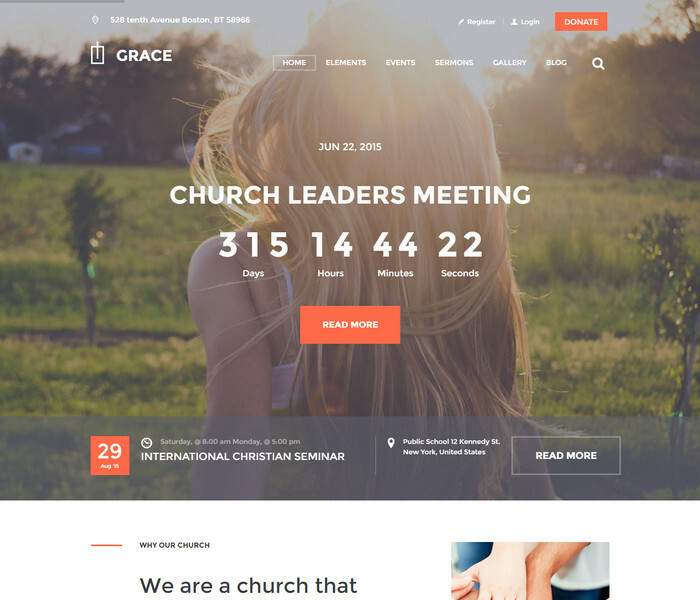 This is a one-of-a-kind modern church theme that will give a really professional look to your website. You can choose from three different versions of the homepage and also create unique slideshows with the Layer Slider included with the theme. There are a lot of church-oriented features like custom Event post type, custom gallery post type, custom sermon post types for managing your daily events in WordPress admin panel. The layout uses a bootstrap framework and thus features a responsive design. Other features include 600+ Google fonts, 600 icon fonts, support & online documentation, Themewaves page builder etc, professional WordPress blog, social icons etc. Build a simple and unique church theme with events and blog news. 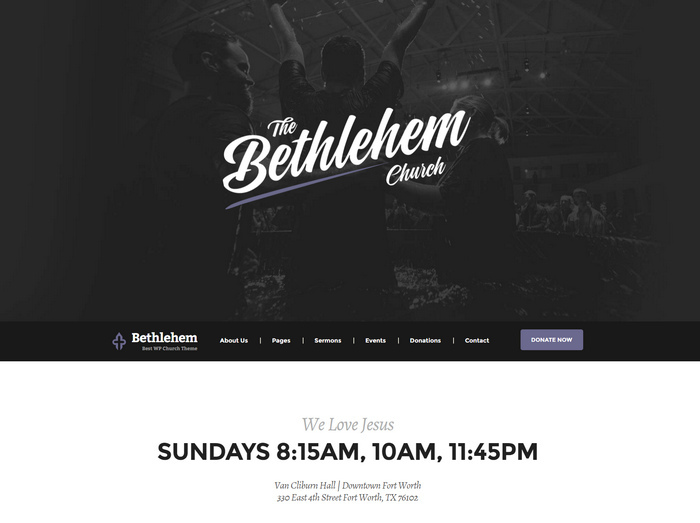 Bethlehem is a flexible WordPress theme built for religious organizations, non-profit and church websites. The theme comes with PSD files for the designers who like to make a complete custom theme design. It also comes packed with 3 homepages, 8 header styles, 3 footer styles and 4 predefined color schemes. The Schema Markup gives advanced SEO benefits in Google search engine results. This theme has WooCommerce support, donation system, events calendar, contact form, blog, Visual Composer – a page builder and all the essential features to build your website. Easily setup events hosted by ministries with an event list and calendar which can be imported to google calendar or any ical importer. Build websites for church ministries involving small prayer groups, family ministries as well as a website for church causes and events. 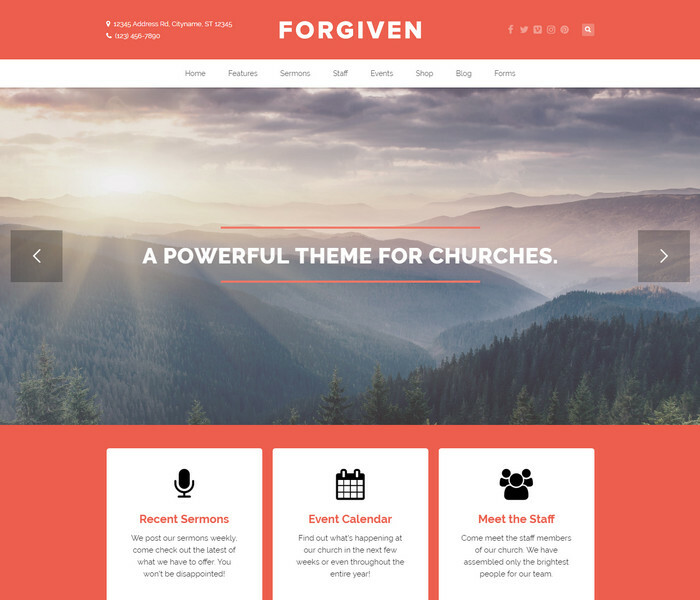 If you are looking for a modern church theme, Forgiven is the best one you can get as it features Revolution slider, parallax scrolling effect for a visual bliss. The ken burns effect on the homepage slider drags you into the website as it pops out the messages with great text effects. The essential features like responsive design, professional blog, sermon post archives with audio or video support, staff & event management, Envira gallery with lightbox popup, an online shop make it the perfect choice for contemporary churches. Any beginner can use this theme which works great on desktops, mobile phones, and tablets. It supports all the necessary plugins like Soliloquy Slider, Visual Composer, contact form 7 plugin, woo commerce that you are going to need. Building a page from scratch was never this easy, you just need to drag and drop the different elements you want on a particular page. Build a church WordPress theme with sermon posts and sell products with an online store for charity purposes. Grace is designed by keeping in mind all the required widgets, shortcodes and features for a church website. The mobile responsive design is fluid and the full-width image sliders look great on any device. The sliders have a swipe effect for mobile devices, tablet phones. The front page is fully-customizable and it can be edited through the admin panel that comes packed with the theme. The demo import will give your website the exact same look of the demo. This feature alone makes it easy to build a church website with little or no prior coding knowledge. At first glance, you will find it has a flat color scheme with minimal design, clean typography, great SEO and awesome social icons. It also has WordPress blog support, a Visual composer plugin with drag and drop interface and much more. The Events Calendar feature allows you to notify your members about the upcoming events easily and it also allows exporting to google calendar or to any email clients. The events can be displayed with a countdown timer on the homepage as well. This premium WordPress theme is compatible with WPML plugin allowing your website to have multiple language support. Build ministry websites, church websites or even non-profit organizations with events and sermons pages. This theme has a unique and sophisticated design that is perfect for churches and other religious prayer groups. You can implement all your ideas that aim towards starting a new community with this theme. It allows you to arrange news, list events and invite people for sermons. The Donations plugin makes the management and processing of payments quite easy. It has amazing CSS3/jQuery animation effects while being compatible with all the necessary plugins. The demo import makes it easy for users with no coding knowledge to install, setup the website on their own. Make pages for volunteers, team leaders, pastors or anyone who is interested in preaching and display them on the homepage. You can create podcasts, sermons, new events with the custom post types, widgets supported by this premium theme. Create amazing websites for prayer groups, faith communities, religious groups and more with ease. 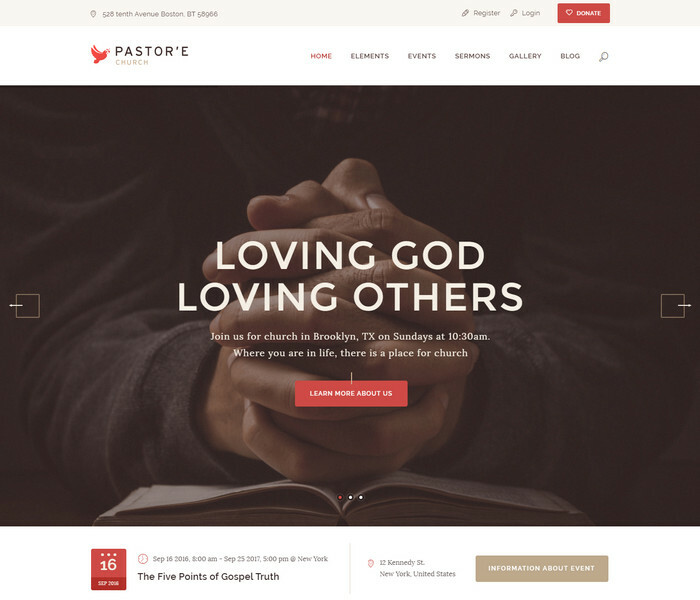 Adore is a powerful, fully-functional theme for churches and charities. You get a built-in, custom-made events manager to manage all your upcoming events. This theme is mobile responsive and retina-ready for modern high-resolution devices. There are 7 gallery pages, 12 color schemes and 150 line icons that come pre-built with this theme. The sliders offer touch or swipe support and the sorting gallery is very responsive as well. It also comes along with a live Twitter feed widget. Easily import demo content with one click to get the theme look and you don’t have to get help from web developers to do that. 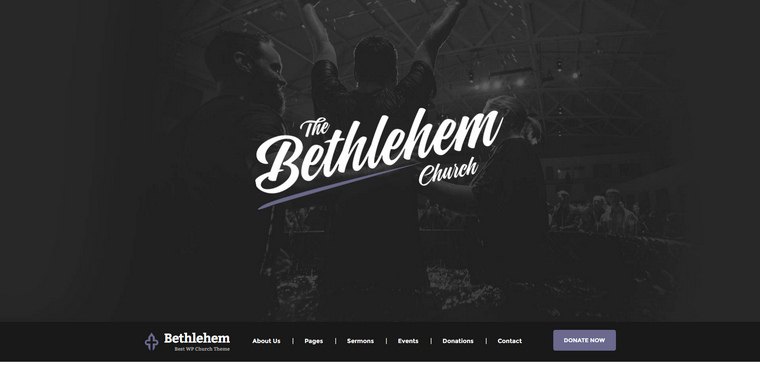 If you are on a budget to build a ministry, faith group website then this theme will be a great choice. Setup a faith community website for ministries, small prayer groups or a charity website with events. 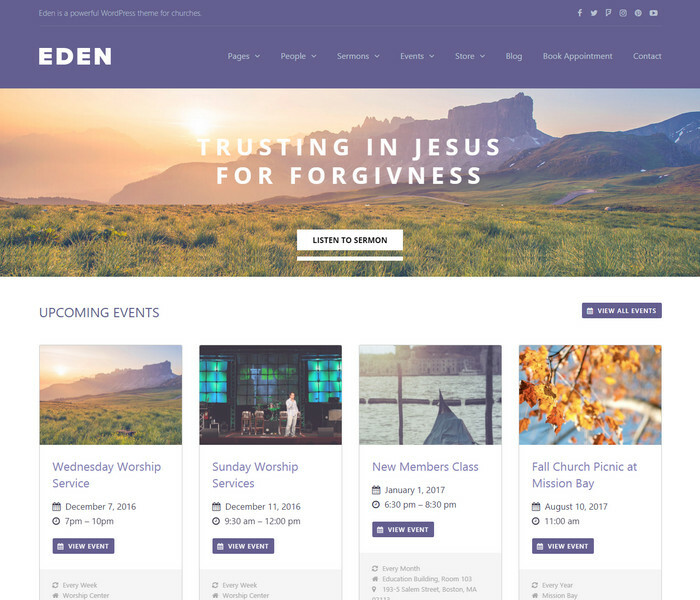 Eden is a beautiful, retina-ready, multi-purpose WordPress theme for churches that guarantees an eye-pleasing experience for the visitors. It is fully customizable and fully translatable with support for WPML plugin. The responsive design layout makes it auto adapting to mobiles devices, ipads, large desktops etc. Other great features in this theme are boxy page builder, WooCommerce Support, Slider Revolution and Visual Composer. The headers, blog and the mega menu can be completely customized to your requirements. Booked Plugin for booking appointments. Build a creative website for churches, charity, prayer groups with event booking and more. 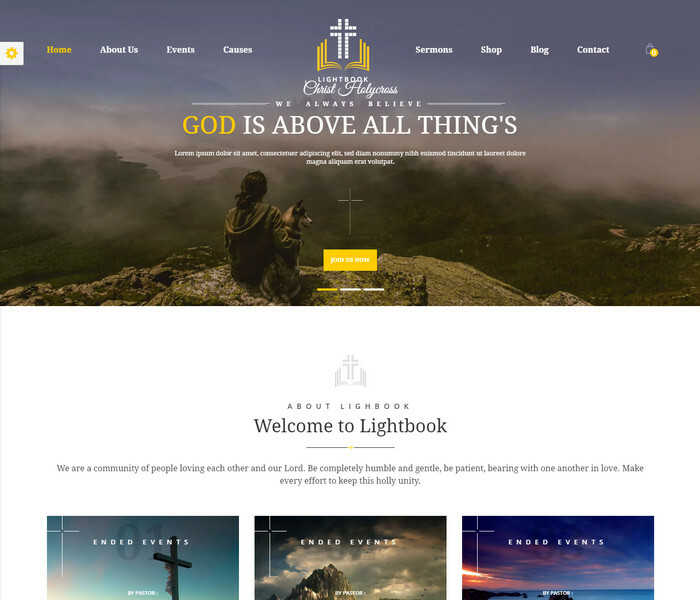 LightBook offers every single feature that a perfect church theme can ask for. From plugins for events, fundraising, campaigns, sermons to elevating donations, it has everything that you can need. The layout of this theme is mobile responsive and also gives a very professional look that helps in building awareness. The 4 different comprehensive homepages are ready-to-use with powerful theme options. Each homepage is built to meet your needs for church websites, non-profit organizations, other religious groups, small ministry groups etc. It also offers more than 20 shortcodes which can turn out to be quite helpful when you want to add new page elements. The inbuilt donation system will help any church causes and fundraising campaigns. There are options to add multiple payments gateways for accepting donations. The modern WordPress blog, contact form 7, shop and almost every essential feature is spot on with great details. 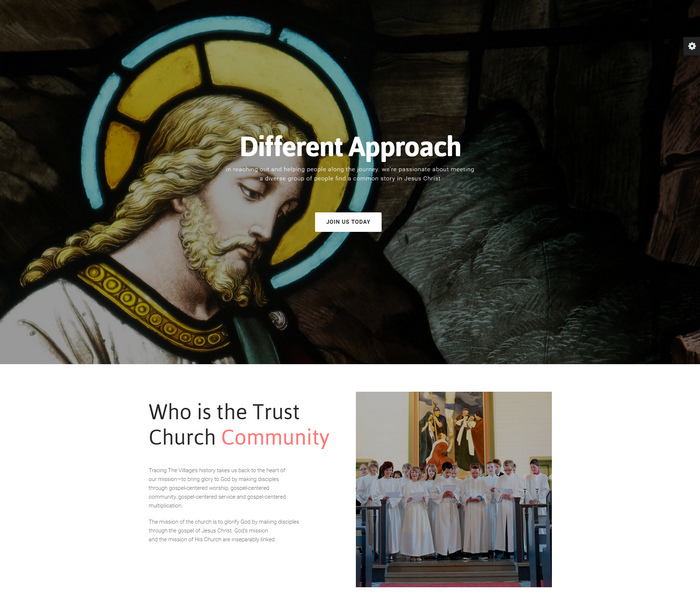 Build a modern church website with a shop for charity and fundraising campaigns as well as have a website for event management or other religious websites. 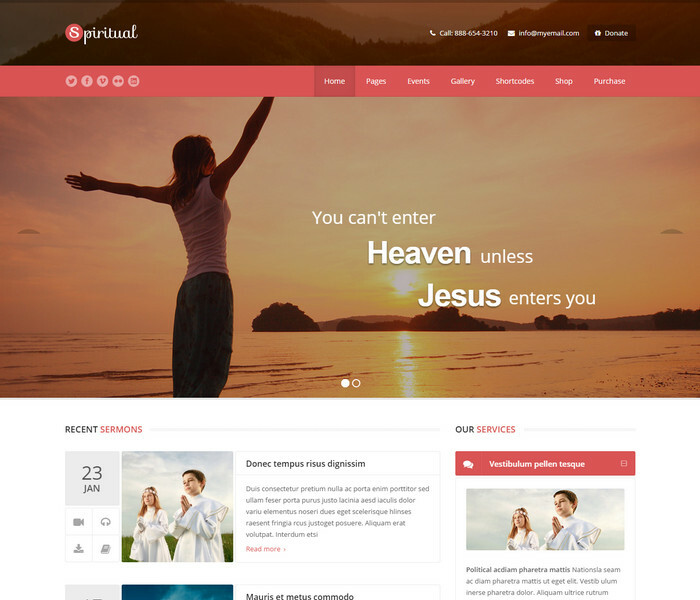 Spiritual is an amazing responsive WordPress theme that offers unlimited color schemes with a robust, mobile & SEO friendly design that is very easy to use. It lets you add custom sermons, display events in a calendar view, create new galleries and much more. The Theme Customizer helps you change, add custom widgets, colors, layout width, advanced blog layout by previewing the changes live before applying. Some additional features like WooCommerce plugin, revolution slider, portfolio, unlimited sidebars are great to have on a church website. The page builder plugin and the shortcode generator plugin makes the task of building custom pages a piece of cake. For newbies, the one click demo import is a boon and for designers, the theme comes packed with PSD files. 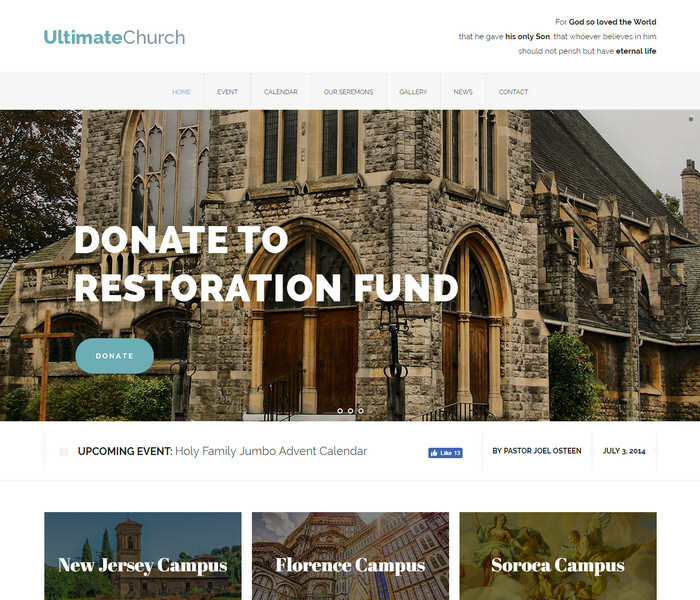 Build a clean church theme for charity and non-profit websites. 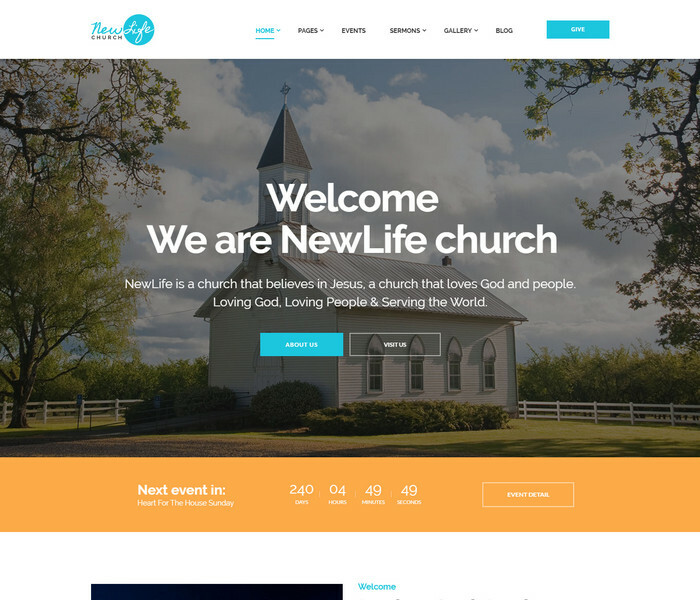 New Life is a light, flexible religious WordPress theme that helps in growing your church, religious organizations, charity websites. The theme takes a modern approach to its design with flat colors and clean typography. The ThemeRex Donations plugin integrates charity and fundraising in the best possible way. You also get Events Calendar, WooCommerce integration with this awesome theme. It also has an email newsletter option, so you can build your own audience and notify them whenever you have a new event or product. Also, showcase portfolio gallery images on the homepage with custom types that come with this theme. Build church and faith communities, small prayer groups and ministries, fundraising for charity organizations and more. 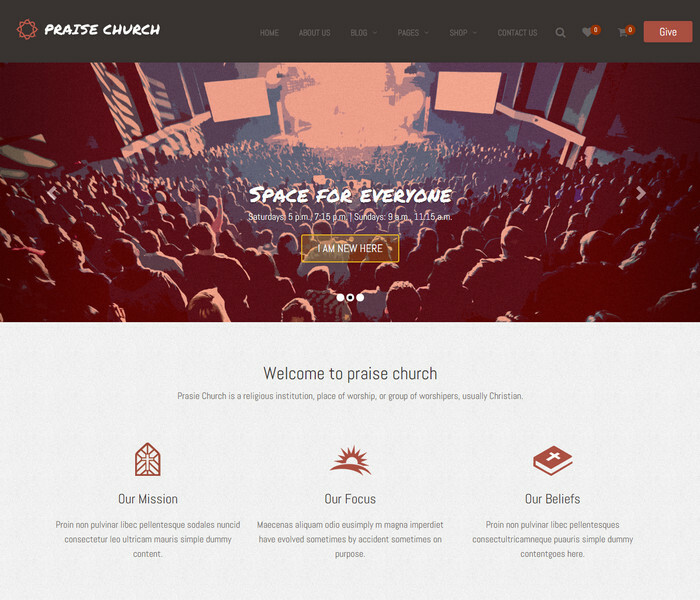 Praise is the most suitable website theme for NGOs, charitable trusts and looks like Hillsong church website. There are a lot of theme options especially one-click demo importer that help you build your website in a matter of minutes. It works well with all major browsers and a mobile-friendly theme that is built with bootstrap grid framework. The advanced theme options like header settings, styling options, typography, Google map settings, WooCommerce, post per page setting and other general settings are useful for fast customizations. Build ministry websites with music and video events, church and faith communities for small prayer groups, charity and fundraising websites for church causes. 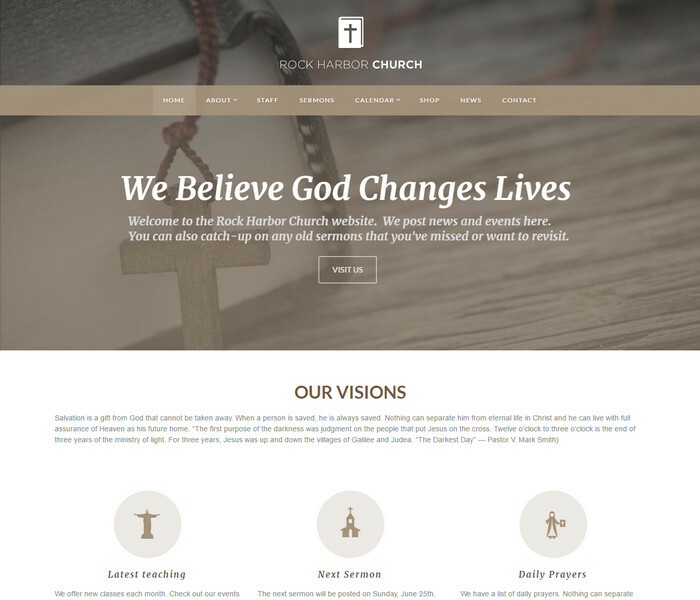 Rock Harbor is a fully-featured WordPress theme that makes it quite easy for you to customize and manage staff, sermons, and events. Along with the theme, you get proper documentation and demo content that has all the details needed to setup the theme fast. There are different sections for sermons, events, news, calendar, staff, pastors, shop and contact you can use. It also provides an option for email newsletter signup. The theme is e-commerce ready, you can start selling any day for charity causes. It offers retina support and responsive layout design as well. Build modern church and chairty websites with events and sermon management. 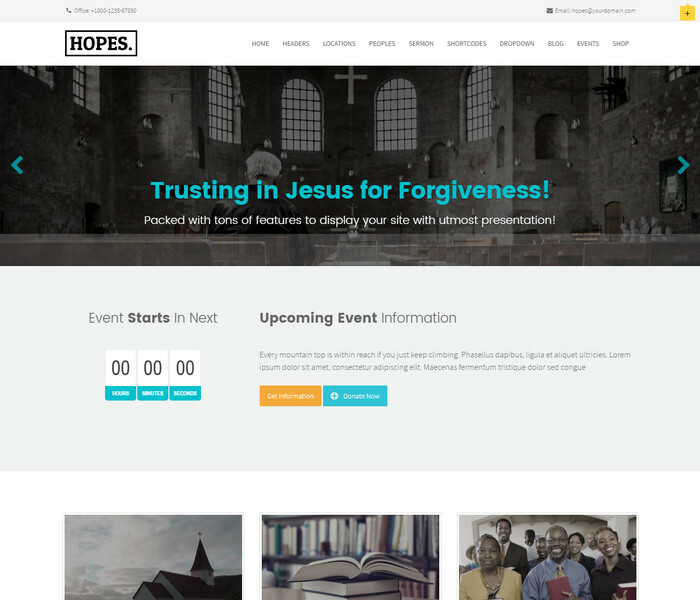 Another great option of WordPress theme for churches, non-profit websites is Hopes. It offers all the important features like mega menu, visual composer, revolution slider and also gives unlimited color schemes. There are many shortcodes and widgets offered exclusively by this theme. The widgets let you display sermons, popular posts, locations, contact info, gallery etc on your website sidebar. It also features google map support to showcase multiple locations your event may be happening. The layout is mobile responsive and you also get a business hours Pro plugin. This cool WordPress plugin displays church hours, office hours or meeting hours, making this theme quite suitable for business purposes as well. The web design is cross-browser compatible and works on every smartphone and tablets. The event calendar plugin is very useful for churches and non-profit organizations to manage events and let followers know of upcoming events. Build a classic church website in a matter of minutes. 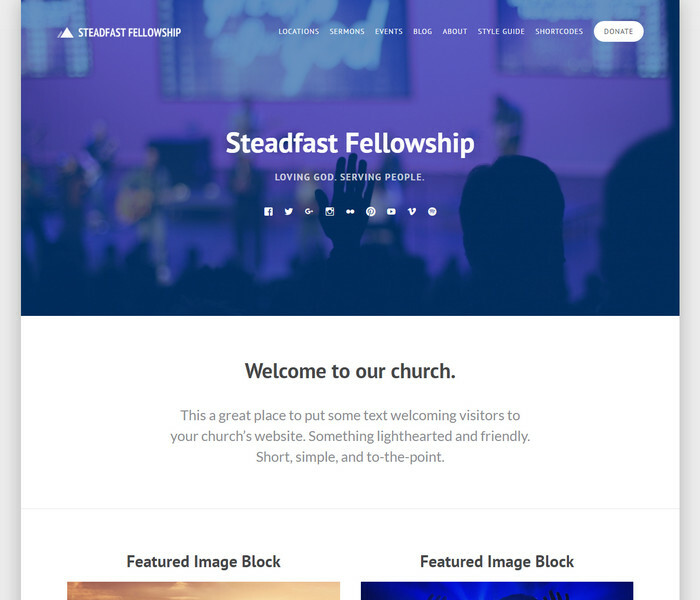 Steadfast is one of the trending responsive church themes from ThemeForest. The layouts can be customized with boxed or full-width layouts. It also lets you customize page and header backgrounds, typography and social media sharing icons, events, sermons and more. Some of the neat features that make this theme most apt for churches are sermon management, event listings and staff directory that can list out the pastors and members. It has a multi-location support that allows you to connect to people living far-off. Build a stunning website for churches, faith communities, ministries and list daily church news, sermons, events and locations. Peace is the most suited theme for all religious groups be it for building Christians, Muslims or Hindu websites. 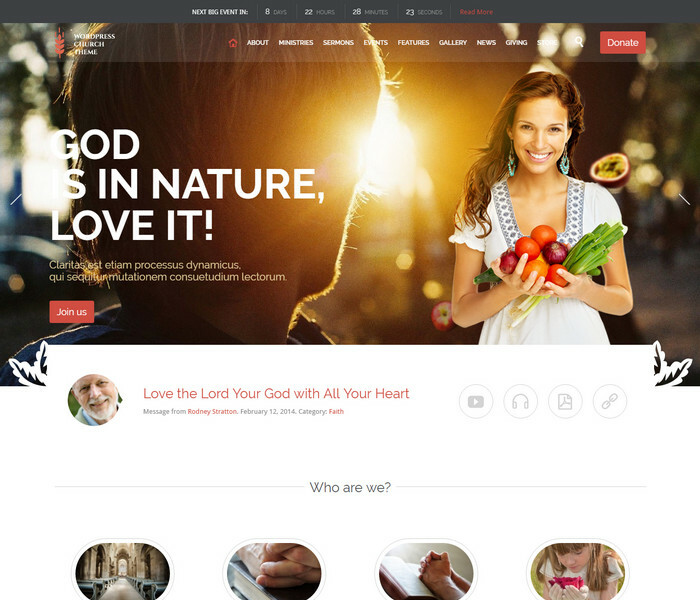 It gives you three layouts and demo content to set up any religious websites in one-click. The theme has an elegant design with cursive heading fonts while giving you the freedom of customizing the website according to you wish. The layout is mobile-friendly and has responsive design. You save a lot of time as the theme includes the Master Slider plugin to build your image slider. Other features you will not miss are WooCommerce, a clean blog, Visual Composer and schedule management. Build amazing religious websites and non-profit organizations in minutes. 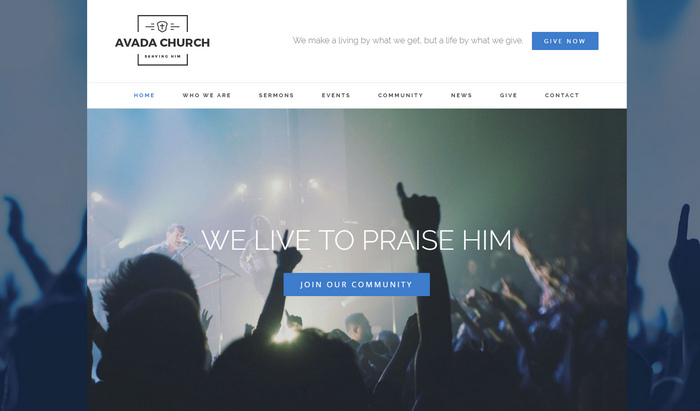 Avada Church is one of the demo layouts of Avada theme that will help you build a great church website. Avada is the most popular multi-purpose WordPress theme that gives you features to set up an amazing website easily. It is also one of the best-selling themes because of the amazing features it offers. You get unlimited designs, some really powerful admin tools, responsive design framework, and a helpful customer support. The events can be listed as featured or in calendar view that is just brilliant to look at. The homepage lets you display sermons, upcoming events, church news, donation buttons and more. 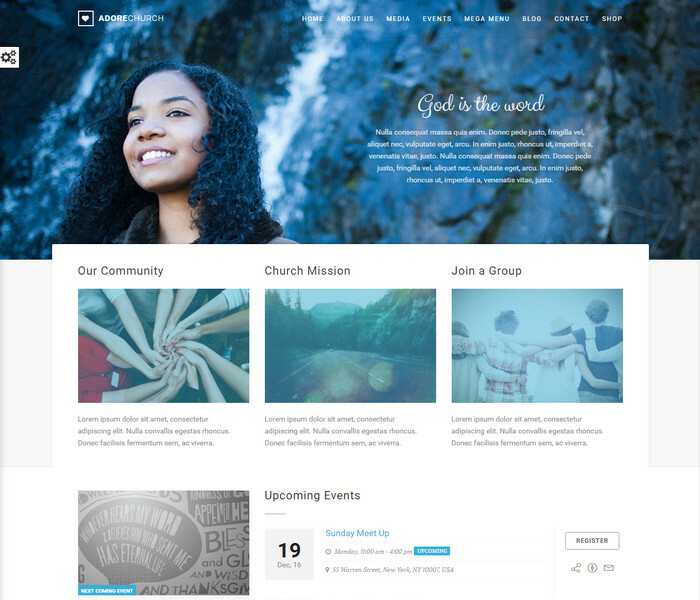 The visual composer of the theme will let you build pages for ministries, about us, communities, contact pages, church causes landing pages etc. Build a channel for prayer groups, faith communities, churches, charity or other religious websites. This is completely minimal design and fully-functional church theme that is as beautiful as its features. You get a lot of Church theme content plugins that are easy to use. X theme is another great theme from ThemeForest marketplace with over 100k downloads. You get WordPress live customizer which can be used to change colors, add a custom logo or backgrounds and more. Adding sermons, events, locations or profile of staff has been made very easy by this theme. You also get dedicated pages for sitemap, archives or 404 errors. The custom header on the frontpage displays a big message that brings everyone to the website. The theme is responsive, retina ready and is cross-browser compatible making it one of the best solutions for any faith communities. Build awesome ministry websites, faith communities, church or religious websites with events, sermons and church news archives. This theme is best for the people looking for a website aimed at crowdfunding, charity or other non-profit organizations. The theme is clean-looking and has all the functions needed to build your website with no prior coding knowledge. The 12 built-in color schemes come in handy when you want to change the accent color of fonts on any page. You also get many built-in custom post types, widgets, shortcodes, different media files for the slider, spam protection for charitable campaigns, church news blog, mega menu navigation, gallery grids etc. Build a powerful website for churches, faith communities, ministries that do charity and like to have a donation system and an event manager. Volunteer is a powerful theme for fundraising and charity purposes. This theme is perfect for a variety of devices as it uses responsive design. Some of the best features offered by this theme are custom donation plugin, parallax effect, campaign management, fast loading, cross-browser optimization, WordPress blog, contact form etc. The Charitable plugin helps in creating campaigns and the donation countdown plugin gives a really professional look to your campaigns. The visual composer page builder will help anyone build brilliant page layout without any prior coding experience coupled with one-click demo content import. 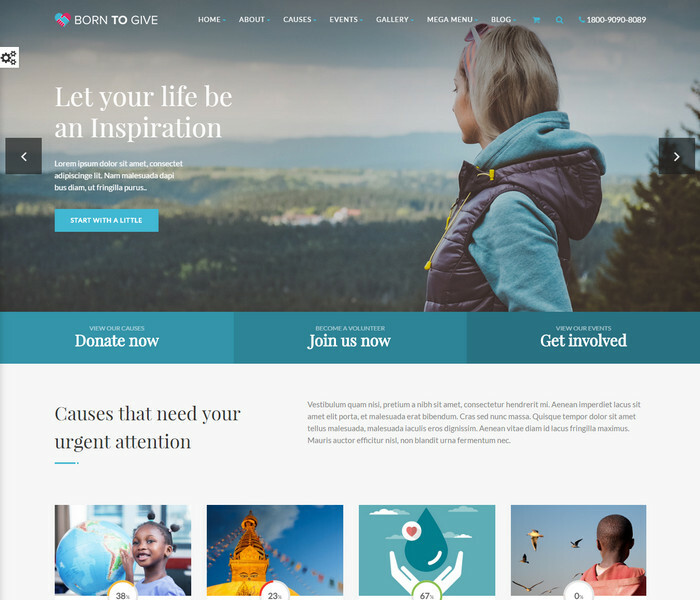 Build websites for fundraising and charity organizations with options to showcase various causes and events. 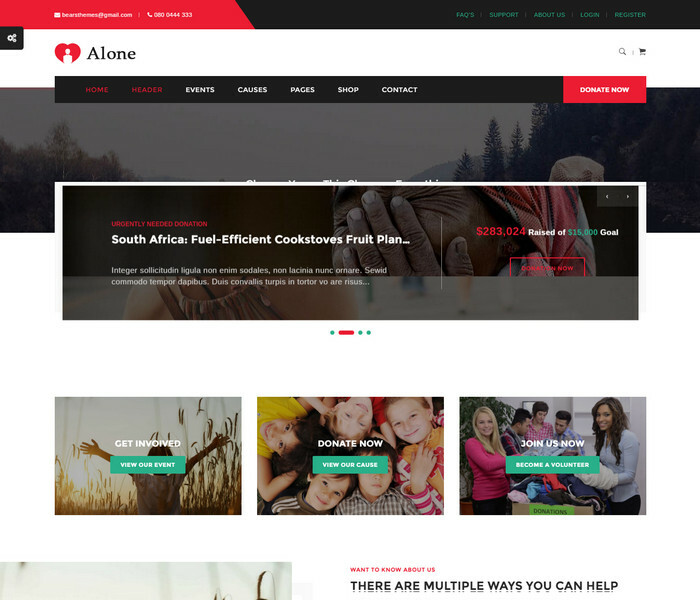 Alone is simply and best WordPress themes for non-profit and charitable organizations. The best feature of this theme is the Charitable plugin and if you use it with a few extra extensions, you can have the right to choose many payment gateways like PayPal, PayUMoney, credit card payments etc. It offers five different homepage layouts, three header layouts, drag and drop builder. You need not worry about SEO, page loading performance, sliders, responsive design, translation ready code, a mega menu as it comes embedded with the theme. Build amazing websites related to charity, environment, church, nonprofit organizations, ministries with ease. 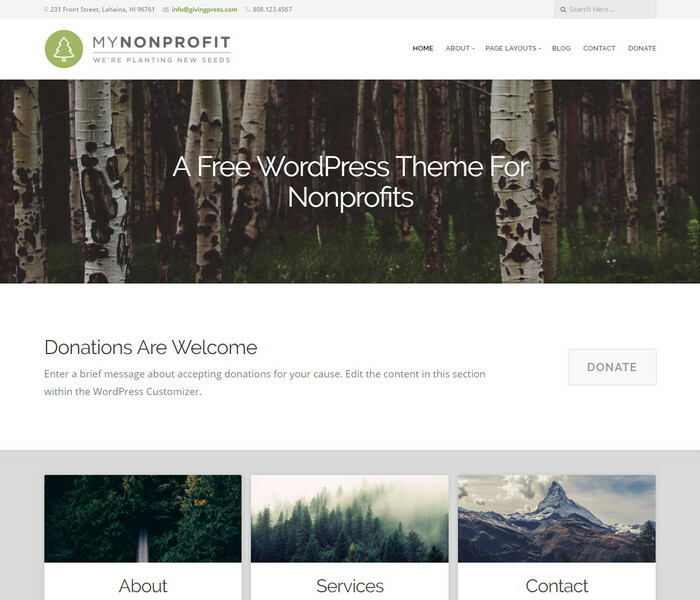 This is a fully featured theme has been specially designed for charities, foundations and other non-profit organizations. It gives you a lovely website that functions well and is mobile-friendly too. It helps you create donation forms, create fundraisers, display your whole team or staff through a modern website. The layout is quite responsive and you have the freedom of customizing the logos or colors whenever you wish. This theme also gives you 24X7 security and daily backups. Build a charity, fundraising, non-profit websites for free with no cost whats-o-ever. 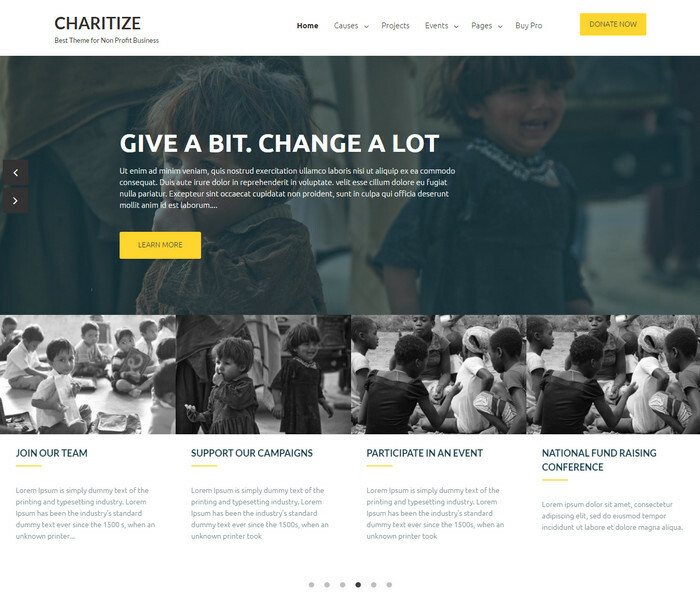 Charitize theme is suitable for all types of non-profit organizations from churches to NGOs. It uses Customizer API and a responsive design. There are more than enough options for the logo, title, tagline customization. This theme provides options for advanced colors, more than 100 fonts, breadcrumb, and pagination. There is an advanced social share feature that will allow the visitors to share information from your website rather easily. It also supports most of the popular plugins like Jetpack, Contact from 7 and PS sitemap. 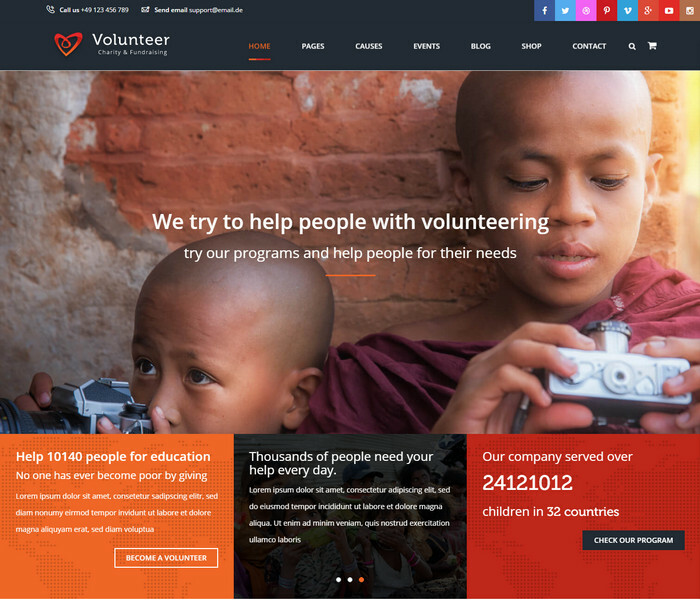 Build charity, ngo website with no cost or coding knowledge with this free theme.